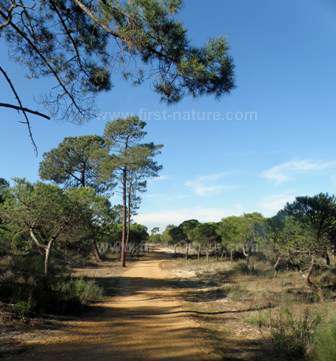 There are a number of trails and walks through the National Forest, which lies on the coast between Vila Real de Santo Antonio and the resort town of Monte Gordo. The walk described here begins at the Chameleon Information Centre, which is closest to Vila Real. This is not a place to see many of the lovely wildflowers of the region, but the forest is one of the few strongholds of the European (Mediterranean) Chameleon. It has a good variety of woodland birds and, in the autumn, it is also an excellent place to go if you want to see some of the region's numerous fungi species. From the A22 take the turning to Vila Real de Santo Antonio and head for the centre of town. At the first roundabout go straight ahead (take the second exit) and continue straight on (southwards). After a short distance you will come to a small building on the right hand side of the road; this is the Chameleon Information Centre. It has limited parking and an information board. On a recent visit (in late December 2013) we could not find any signage to the Centre, and it was closed so comprehensively that it appeared to be abandoned. The information board outside the Centre has a map of trails and some information about the trees and vegetation in the forest, but absolutely nothing about the European Chameleon. As it seems to be closed for a large part of the year this is a missed opportunity to support wildlife tourists to the region. We will be returning in spring 2014 and will provide updated information if we are able to get any. There are no facilities on the walks but there are cafes, toilets and shops in both Vila Real and Monte Gordo. Spring 2014 - this facility remains closed. The trails through the forest are level and easy-going. The trails through the National Forest are level and easy-going. The forest is dominated by the Stone Pine, but in places Cork Oaks, rare in this part of the Algarve, are also present along with the Maritime Pine and the Strawberry Tree Arbutus unedo. The dense understory is largely made up of various broom species. Without doubt the star of this reserve is the European (or Mediterranean) Chameleon. 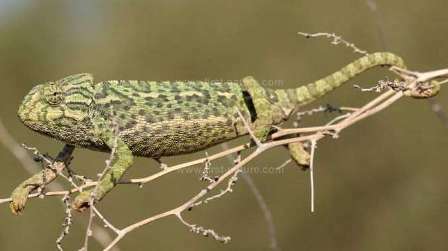 First recorded in the Algarve in the eighteenth century, these reptiles are quite closely related to the Moroccan chameleons and probably arrived in the Algarve courtesy of imported goods. 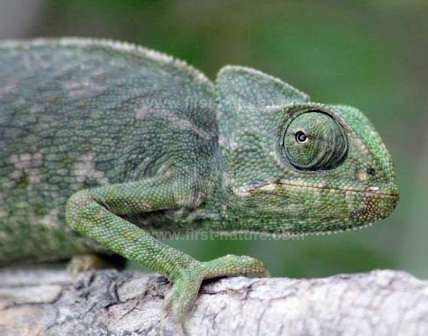 Despite the known high density of chameleons in the forest, they are extremely difficult to spot because of their ability to change colour and merge almost seamlessly with their surroundings. In September and October the females descend from the bushes to the ground in order to lay their eggs, and at that time they can be seen wandering about on paths and even crossing roads. They are seemingly uninterested in humans, and it is fascinating to watch them catching insects on their long, sticky tongues. Dependent on rainfall, September also marks the start of the fungi season in the Algarve, which peaks in November and early December. 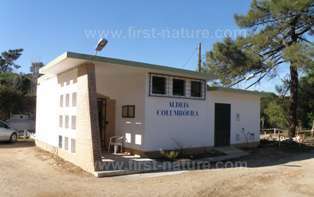 The combination of Cork Oaks and pines found in the National Forest is an ideal one for mushrooms. Conspicuous species to look out for include Fly Agaric Amanita muscaria, Wood Hedgehog Hydnum rapandum, Terracotta Hedgehog Hydnum rufescens and the Spectacular Rustgill Gymnopus junonius.